Horsey Stuff • Racing • ThoroughbredRacehorses to Remember! Over the centuries of horse racing, there have been many champion horses. However, there are only a handful of horses who really stand out. These horse’s names are often recognised by people all over the world and several have films about them, documenting their life. They truly are racehorses to remember! 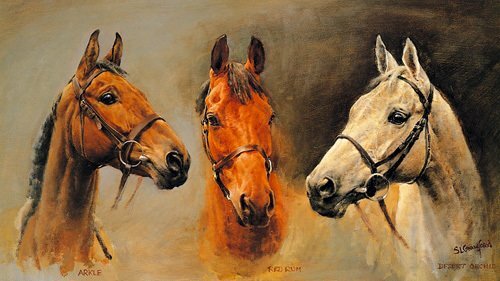 I wanted to dedicate this post to some of my favourite outstanding racehorses. Some of them are more well known than others, and many are before my time! But these are just a few horses I believe need to be remembered. 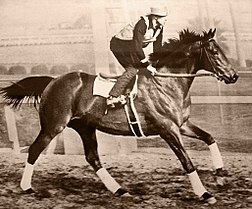 Seabiscuit is best known for being a small horse who beat all odds to become the American Champion racehorse. It is a real life underdog story, giving many people hope for a brighter future during the Great Depression. He wasn’t hugely successful when he was younger, finishing near the back in his first 17 races. However, after a few wins he was sold to Charles Howard. The new trainer, Tom Smith used unorthadox methods to get great improvements out of Seabiscuit. He won many big races over the next few years, however, he is possibly best remembered for the match race against War Admiral (his uncle). It was one of the biggest races of the time, and Seabiscuit won with style. This big chestnut horse is best known for being the first horse in 25 years to win the American Triple crown and setting new records on each track. His record at Belmont still stands today. He is often ranked 1st or 2nd as the best race horse of all time, coming second only to Man O’ War. He is best known for his performance during the Triple Crown and how he beat another champion racehorse, Sham, with style. After his death, they examined his body and found that his heart weight 10kg, which is more than double the average racehorse’s. This could be a factor as to why he was such an amazing athlete. Phar Lap is best remembered for the suspicious circumstances surrounding his death. He was a champion racehorse in Australia and was believed to be unstoppable. Although he had a slow start to success, once he started winning, nothing could catch him. He won races carrying more weight than a horse had ever carried before. This weight increased until it was impossible for him to win and the owner decided to race him in Mexico. He was an Australian hero during the Great Depression, despite being bred in New Zealand. He died while in Mexico of a mysterious illness. Although vets diagnosed it as colic, many people believed that he was poisoned, causing the colic. A true British hero, often remembered as the champion of the Grand National. He won this race three time and came second twice, which is still unheard of. He won with amazing style in 1973, coming back from being 30 lengths behind the leader in the final stages of the race. He was buried by the finishing post at Aintree and his grave is still visited by race goers today. 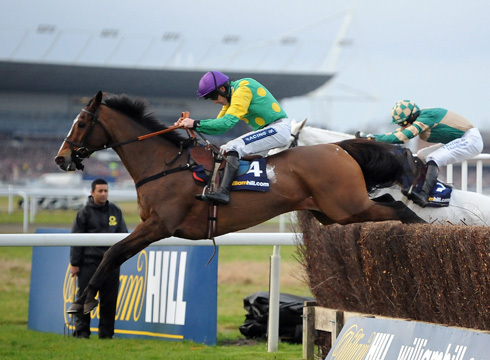 He truly is the Legend of National Hunt racing. She was possibly the best filly ever to race, her reputation almost rivalling that of Secretariats. She won the filly equivalent of the Triple Crown in 1974. She was unbeaten and she would start every race by jumping to the front and slowly leaving the rest of the pack behind. She won her first race by 15 lengths. She met an early end during what was meant to be the greatest match race of all time against the top colt of the time. 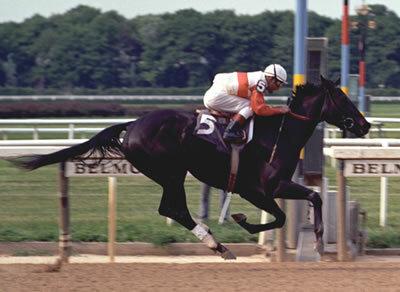 They were well matched, but Ruffian started to take the lead. She took a bad step when she snapped her two sesamoid bones in one foreleg. The jockey tried to pull her up, but by the time he had, she had done much more damage. She was taken straight to surgery to try and save her. They did their best but on waking up, she panicked and thrashed about, causing more damage. So she was put to sleep. This unbeaten stallion is a true favourite of the British public, winning all of his 14 races in style, with only one close moment. He was a strong cocky horse who wanted to be at the front and wanted to go as fast as he could. He enjoyed winning and had a larger stride than the average racehorse. He covered his first mare in 2013 and his foals have sold well so far. We should start seeing how well his offspring perform in the next few years to judge how good a stallion he is. However, as amazing as he was, I believe it is how this horse changed the fortune of his trainer Henry Cecil and their story together that won over the hearts of the British public. Although he was a champion National Hunt gelding, he is possibly better known for his life after racing. When he was retired, he was sent to the event rider Laura Collett to be retrained for dressage. This high profile horse was used as great publicity for the Retraining of Racehorses (RoR). However, after a performance at Olympia and after his tragic death after a field injury, Collett has met much criticism, bordering on abuse, on the welfare and management of Kauto Star. He beat and formed new records throughout his racing career for most wins at tracks and in specific races as well as earnings. This made him one of the best Steeple Chasers ever and I believe giving him the opportunity to have a new life and career after racing was the right thing to do for this champion gelding. One of the best Steeple Chasers of all time, remembered for his front running, attacking approach to races. 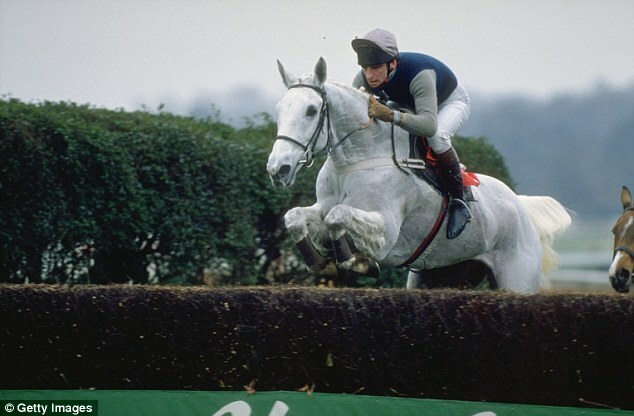 He is rated 5th best National Hunt horse of all time. After having a nasty fall in his first race over hurdles, he switched to steeple chases, where he was much more successful. He retired in 1991 and spent the rest of his life in Newmarket, coming out on the track for the odd parade, to the delight of the crowds. Have you seen Seabiscuit and Phar Lap? Also very good films!! No I haven’t. So far the only ‘racehorse’ movies I’ve seen is Secretariat and Racing Stripes (Fake, btw). I’ll have to check them out! !